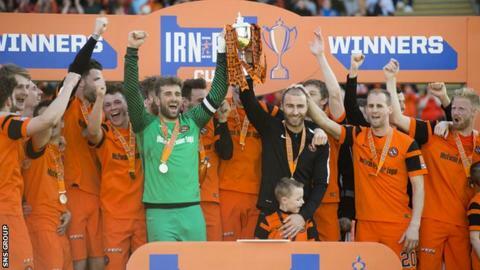 Holders Dundee United are at home to Cowdenbeath in the first round of the Irn Bru Challenge Cup. Last season's runners-up St Mirren take on Lowland League champions East Kilbride, while Highland League winners Buckie Thistle host Brechin City. Morton are up against Livingston, Queen of the South welcome Airdrieonians, Dunfermline meet Arbroath and East Fife are paired with Peterhead. Colt teams from all 12 Premiership clubs are involved at this stage. Falkirk and Inverness Caledonian Thistle enter in the second round, along with Crusaders and Linfield from Northern Ireland, Welsh duo Gap Connah's Quay and The New Saints and Bray Wanderers and Sligo Rovers from the League of Ireland. The first round ties will be played on the weekend of 15/16 August.